Chef Daniel Marquez of Zacatecas Tacos & Tequila circles back to the word authentic many times when describing the food at the upscale tacqueria and tequila bar in Albuquerque’s Nob Hill neighborhood. And for Marquez, there is a close association between authenticity and locally sourced food. The summer vegetable tacos as Zacatecas utilize the season’s freshest bounty. A native of Mexico City, Marquez has traveled extensively throughout Mexico, a country that has some of the most varied culinary traditions in the world with regional subtleties in every state that speak to the complexity and diversity of Mexican cuisine. We sometimes lose track of that diversity here, where New Mexican, Southwestern, Tex Mex and Mexican often get thrown together in the terminology food processor. But make no mistake about Zacatecas: It is eponymously named for the state and city capital in north central Mexico, a region known for producing the bulk of the country’s strawberries, avocados and agave azul, which is used for making tequila. Marquez, who came here 2 years ago to open the restaurant for owner Mark Kiffin, the James Beard award-winning restaurateur of The Compound in Santa Fe, describes the food at Zacatecas as modern Mexican comfort food. And comfort is important to a guy who says he used to be a picky eater until curiosity spurred him to a culinary life. “Every dish is crafted with authenticity. That means knowing the history and the ingredients and recognizing the flavors. Interpretation is knowing and utilizing what is around,” says Marquez. With this cooking ethos central to his style, it’s no wonder Marquez purchases ingredients from local farmers who deliver to the restaurant. He also shops at area growers’ markets. But because weather can vary so much and the growing season is shorter than he would like for certain items, Marquez says that daily specials are the best way for him to feature locally grown food. 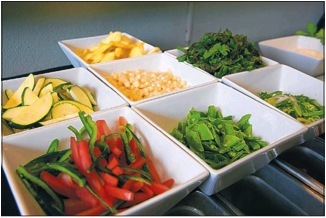 Ingredients are prepared for the summer vegetable tacos at Zacatecas. This time of year, Marquez buys locally grown zucchini, squash, snow peas, chard, beans, corn, squash blossoms and tomatoes to enhance his menu. He also purchases New Mexico lamb that is featured in a number of regular menu items. Marquez holds culinary degrees from the College of Southern Nevada and the Culinary Institute of America in Hyde Park, N.Y. With his emphasis on fresh, organic ingredients and contemporary Mexican style, he captured the James Beard Foundation semifinalist award for “Best New Restaurant” in 2013. “It is very important to understand where things come from, and the seasonality of food. 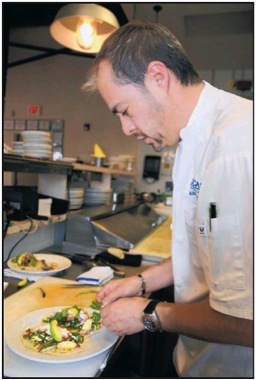 You can use very simple cooking techniques with locally grown food because of its purity and its taste,” he explains. Marquez is a calm presence in the kitchen, and watching him prepare summer tacos it’s evident that details are what elevate a taco from average to amazing. All it takes is preparation time, locally grown produce, locally made tortillas (if possible), and a secret ingredient or two — namely chipotle butter and cotija cheese. Chipotle butter is a compound butter, or a mixture of butter and chipotle peppers in adobo sauce. Compound butters are used to enhance flavor in various dishes, similar to a sauce. Once the chipotle peppers are whipped into the butter, the butter can be reformed in plastic wrap or parchment paper and chilled until it is firm enough to be sliced. Cotija cheese is a strong-flavored Mexican cheese that is sold aged, making it a bit dry, salty and almost granular in texture. It is often served crumbled, and it doesn’t melt so much as soften. You can find cotija cheese at many grocery stores, but if you need a substitute, Parmesan or feta is acceptable. Marquez gets his pan smoking hot before he adds the butter. The rest goes quickly. He adds the vegetables to the pan, a bit of seasoning and cooks the mixture for a few minutes before spreading it across warm tortillas. Finishing touches are the pico de gallo and cotija cheese. 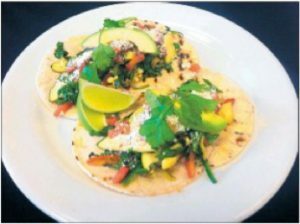 Summer vegetable tacos are a great way to use a variety of growers’ market produce, and it’s easy to customize the contents based on what you find at market any given week. With Marquez at the helm, it’s easy to see how authenticity includes place, history, culture, ingredients and the person doing the cooking. “Cooking awakens the instincts and creates memories,” says Marquez. Zacatecas is located at 3423 Central NE, Albuquerque. In addition to the food, there are a variety of events such as live music, tequila dinners, and more. UNM students and faculty are invited to use the open-air dining room and Wi-Fi.